Textured Plus Size Tee is rated 4.8 out of 5 by 28. 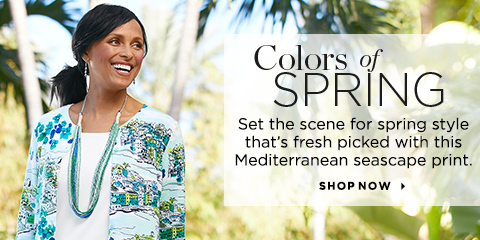 Touchable textured fabric and a pretty print in springtime hues make this casual tee a perfect addition to your wardrobe. Rated 2 out of 5 by mllss from Nice Top but not put together good. My husband bought this for me for Christmas. I really liked the print and the way it fit. Before I put it away I noticed that the seam on the neck was not tucked down properly. I took it back to the store. There were more in my size but they were all the same way. I had to return it for a refund. Rated 5 out of 5 by mart5121 from Great style and pretty colors Bought this top for my (fifty +) daughter for Christmas. She likes the 3/4 sleeve style, material, and the colors. She is very fussy about what she likes/wears and this top fit her well, and looks very nice on her. Rated 5 out of 5 by Necklace from Awesome Very pretty colors and soft material. It goes with many colors as well. Rated 5 out of 5 by Grandmafaraway from So comfortable! I bought this for our cruise. Love the mix of colors to go with different bottoms. Rated 5 out of 5 by Suzieq68 from really liked the color match The shirt is very bold and colorful, but at the same time trendy and dressy. I can wear it with casual capris or with dressier slacks. I am very pleased with this purchase. Rated 5 out of 5 by Miselaineous from Soft textured fabric Great soft textured fabric. It's light enough to wear year round. The sleeve length will work in any season, cool enough in the warmer months and warm in the fall and winter. Rated 5 out of 5 by Food pantry worker from Great! Very comfortable , love the fabric. ( just don't make tops with stripes going across for plus size women....very UNFLATTERING!!! Rated 5 out of 5 by Janiece from Great colors! Wore this to a former employees Christmas party this past weekend. The fit is great & looked very nice with my navy dress pants.